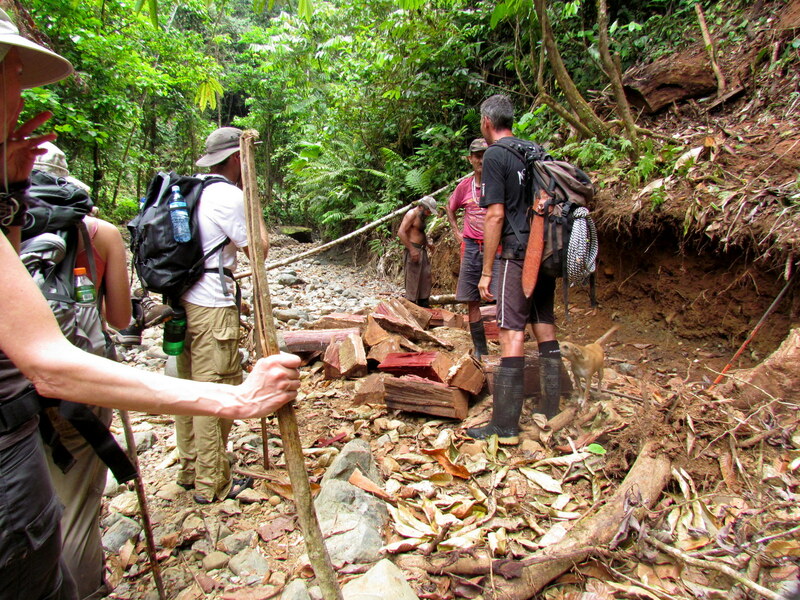 Our friend Edwin works with a Dutch company called Mambo that sells adventure travel. He was developing the Sendero de Oro as a new back country trek and needed guinea pigs for testing. Of course we jumped at the chance to volunteer. Camp EdEase is one of the great places. At the junction at the Quebrada Piedras Blancas (up high in the mountains it loses it’s river designation and is renamed as a stream) and an unnamed quebrada coming in from the south one drainage west from the Río Nuevo it’s sited on a hilltop overlooking both. When we arrived it was early afternoon and after a exploring a little everyone pitched in to get dinner started. Meals were hearty and delicious. Dinner was grilled pork loin, potatoes and chayote squash. While two of the oreros who would join us for the meal got the fire going for the BBQ others got the the cook stove at the end of the shelter going and started prepping veggies. 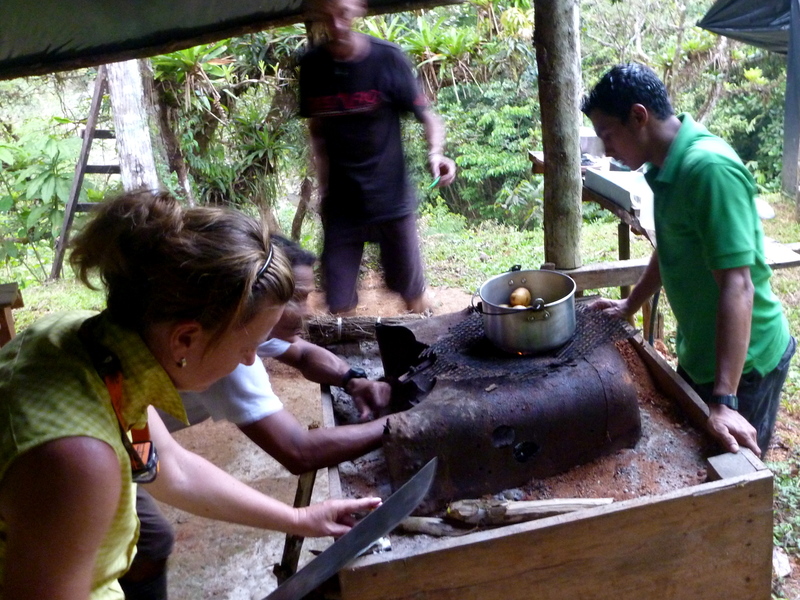 The traditional stove in Costa Rican camps is an elevated wooden box filled with sand. A metal Jerry can with a hole in the side supports the metal grate holding the pan full of potatoes over the fire. The traditional kitchen knife (a machete) was wielded skillfully to mince garlic. I volunteered to haul water knowing full well that they’d just installed a pipe from the spring to brand new sink brought in along with the porcelain toilet by horseback earlier that day. After dinner Ed broke out the guaro. At least I think that’s what the vodka bottles were re-filled with…it’s possible it was rubbing alcohol but you never can tell for sure with guaro. We heard from the German couple (sorry I keep calling them the German couple but I’m terrible with names, worse speaking German, and we really only saw them for a few hours at dinner) about their horseback ride along the ridge above the Piedras Blancas. We were hearing about one of Eds other trips down the Río Savegre (definitely on our list for next time) when Johnnie quietly walked over and sat down at the table holding one of the most feared snakes in tropics. Needless to say it created some excitement even though it was a very small one. 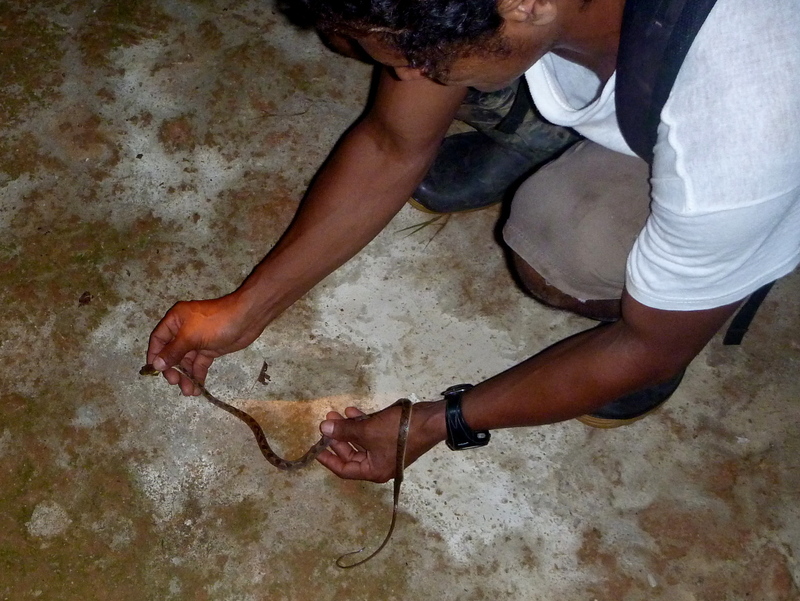 Everyone calmed down even more when he assured us it was a “terciopelo falso,” a mimic of the feared viper and completely harmless. We soon had more company when a headlamp bug landed on the table. Since Ryan and Meg lived on playa Hermosa in the dry regions of northwest Guanacaste they’d never seen one of these residents of the southern rainforests. After catching it carefully I handed to Ryan and explained that the headlamp bug has a pair of yellow chemi-luminescent lights (like a firefly) on the top and a much brighter green spotlight below that only seems to light up in flight. (Pyrophorus noctilucos) in Spanish it is known as carbunco, cucubano, saltaperico, or my favorite tuco-tuco. The shell is jointed in the middle and if you pick one up it will snap repeatedly from a flat to arched position making a loud click and sending a shock into your fingers…most likely you’ll be so startled you’ll drop the bug which is exactly what this defense mechanism is designed to make you do. In the morning the German equestrian couple left us and returned to Dos Brazos because the trail ahead was too steep for horses. Before setting out on the third day we hiked up a drainage just outside Corcovado national park to visit one of the biggest mining operations in the Osa. Fifty years ago this was the last frontier where most businesses on the peninsula had a scale on the counter so the miners could pay for their purchases with gold; now it’s all dollars or colones. As with most gold rushes the only ones who made consistent money were the merchants who transported and sold food, booze and tools. There also used to be a strong market for mercury which was used to extract gold from ore, but now the miners themselves have eschewed this practice (it has always been illegal) because they’ve seen the effects of mercury poisoning on the rivers they live along and rely on. We were told mercury extraction was never particularly cost effective anyway because most of the gold in the region is free in flakes rather than mixed with other minerals in ore and mercury isn’t cheap. 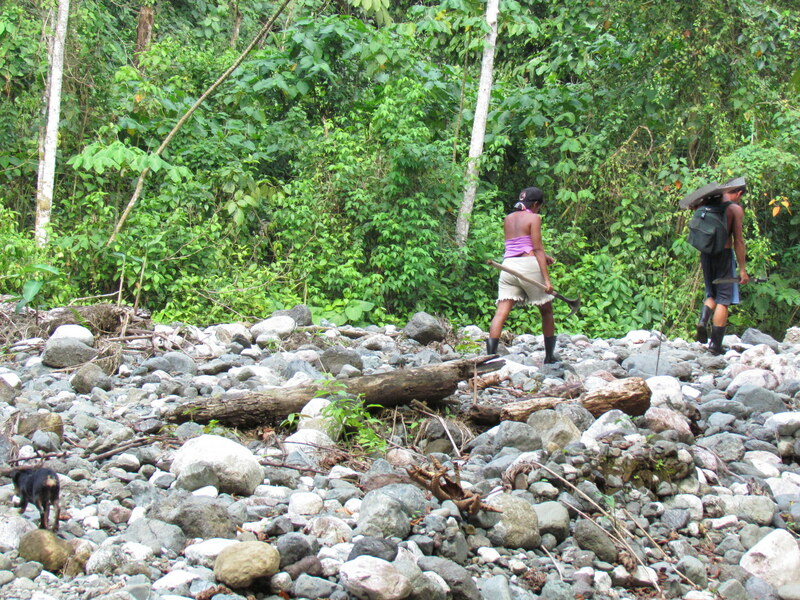 Currently there are two main types of operations on the Osa, prospecting in the gravel riverbeds and small hand dug mines in the hillsides. The mines are typically just a hand excavated tunnel barely big enough to crawl through on hands as knees (Meg discovered that she might be a bit claustrophobic when she ventured in). The shaft the miners showed us went back about 30 meters (100 feet) and never widened out. It’s hard not to look at the scars on the hillsides and rivers and condemn the oreros for environmental destruction but on the scale of real destruction like housing developments and raw sewage from millions of people flowing into Costa Rica’s rivers their little holes are a pretty minor impact. From the number of camps along the river I’d estimate there are well under a hundred total miners and probably less than twenty five tunnels in operation spread out along 15 km. All of the men we met (there were no women or children in the mines or in the camps) were friendly, happy and seemed like genuinely good people just trying to get by. Whether from digging underground or just scooping shovelfuls of gravel from the riverbed the gold is captured in the same way. Earth or gravel are deposited into a “canoa” or sluice where rapidly running water in a narrow channel washes away the lighter dirt and rocks and a rough bottom traps the dense gold nuggets and flakes. The canoa can be as simple as a small ditch dug in the mud and lined with Astroturf (to slow and trap the gold particles) or a slightly more sophisticated and portable version consisting of a long metal tray with a panel of metal mesh on the bottom. Either way the sluice is filled one shovelful at a time so the environmental impact of these methods is relatively minor. 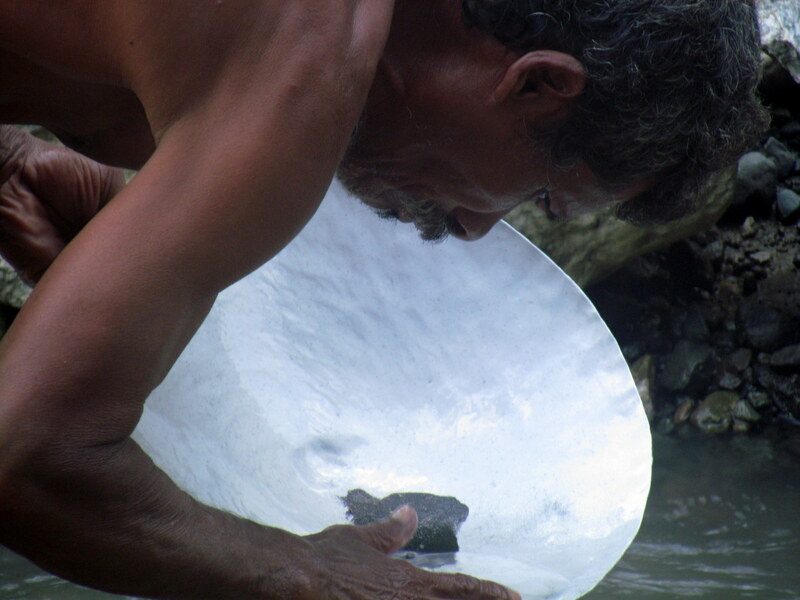 We met an old timer carrying a pan that he used while standing in the river scooping in a couple of handfuls at a time then whirling it in a mesmerizing oscillation that lets the water wash away everything except the flakes of oro. 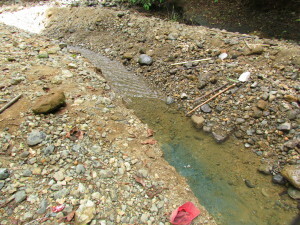 The main direct impact of mining and prospecting is the addition of silt to the rivers and streams, but the small scale of the operations where the largest tool is a hand spade means that the impact is washed away in the heavy rains and gully washing floods that come every September and October. 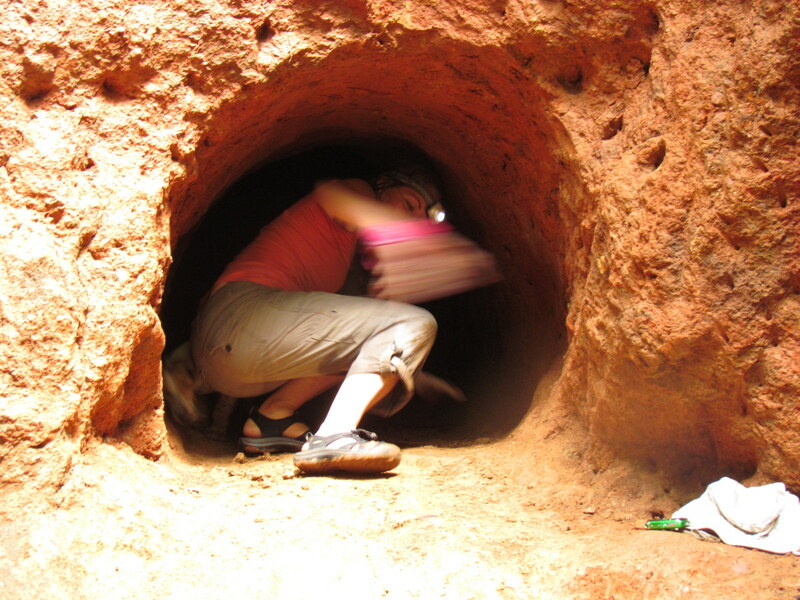 The indirect impacts are more significant and the most noticeable is the lack of wildlife in the mining regions. 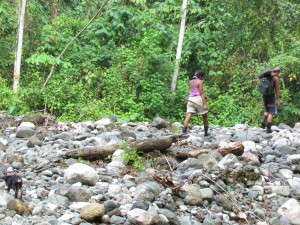 Hunting is permitted on some of the private land and poaching inside the National Park is common. Birds, reptiles (except iguanas which are good eating) and amphibians are easy to spot, but mammals are almost never seen along the sendero de oro, even where it crosses the southern sector of Corcovado. 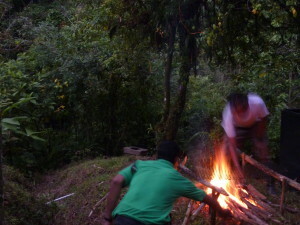 Other environmental concerns include cutting firewood and the small garbage dumps that accumulate near the camps but these are relatively minor compared to the impact of other rural activities like farming or ranching. There have never been any big strikes on the Osa, just enough minor successes to keep fortune seekers coming back. Increasing urban unemployment has caused a surge in the numbers along the sendero de oro. It only takes a few dollars worth of equipment to set up camp and get started so we met several mineros who had arrived in the past couple of months after deciding that shoveling gravel was a better use of their time than hoping for a job opportunity in San Jose. After walking back down the Quebrada to Camp EdEase we set out to climb the Fila Nuevo and head down to the Pacific coast.